Pancreatic ductal adenocarcinoma (PDAC) is associated with pain in 75% of patients at the time diagnosis of and ultimately in about 90% of patients. While the World Health Organization (WHO) advocates for initial use of nonsteroidal drugs and acetaminophen, the majority of patients require opioids for refractory pain. Unfortunately, over 50% of patients report ongoing and poorly managed pain despite opioid administration. Celiac plexus neurolysis (CPN) is often performed to help optimize pain control. Likewise, patients with chronic pancreatitis often experience refractory pain that is occasionally treated with celiac plexus block (CPB). The goal of this report is to describe some Tips and Tricks that may be of assistance in performing these techniques, understanding that there are lacking data to reach firm conclusions regarding many aspects of these procedures. Tip/Trick #1: Distinguishing between celiac plexus neurolysis (CPN) and celiac plexus block (CPB). For proper patient consultation, documentation, and procedure preparation, it is important to distinguish celiac block from neurolysis. They are distinguished based on the contents of the injectate. While both typically include the use of a local anaesthetic (e.g. bupivacaine), CPB refers to the administration of steroids for benign disease (chronic pancreatitis). Rather than producing neural destruction, steroids are less injurious, yet shorter acting as compared to alcohol administration. While there are limited data concerning alcohol injection (CPN) in the setting of chronic pancreatitis, most do not advocate its use as the risk may be greater than for steroid injection. In addition, the long-term effects of neurolysis have not be established given that the CPN has largely been restricted to patients with PDAC with too short a survival and too many confounding variables to make this determination. Tip/Trick #2: Distinguishing between celiac plexus neurolysis (CPN) and celiac ganglia block neurolysis (CGN). In contrast to the aforementioned tip, in which the composition of the injectate varied, the distinction between CPN and CGN pertains to the difference in site of injection. The celiac plexus consists of a dense network of interconnecting nerve fibers and ganglia. The ganglia represent a collection of nerve cell bodies and glial cells that are each connected by a network of neural rami and septae of connective tissue. EUS now allows direct injection of the ganglia versus the diffuse spread of the injectate that occurs with plexus therapy. The CG are located to the left of the celiac artery, and anterior to the aorta. 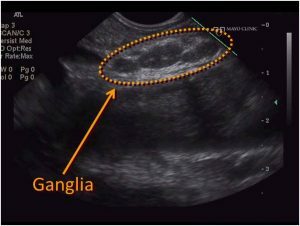 They are usually oval or almond shape and most endosonographers can identify them in 90% of more patients and typically 1-5 ganglia per patient. Tip/Trick #3: Don’t forget about your radiologists and anaesthesiologists. CPB and CPN may be performed via percutaneous (PQ) routes by radiologists and anaesthesiologists for over 100 years. EUS-guided CPB and CPN were introduced as an alternative to percutaneous techniques, with the goal of improving pain control and safety. Despite the theoretical advantages of EUS CPN, the absence of comparative data prohibits any assessment of the relative safety and efficacy. Given the lack of evidence of a preferred route of therapy (PQ versus EUS) and the cost differential, if there is no other reason to perform EUS in a given patient, then the preferred approach may be via a PQ route. Tip/Trick #4: Relative efficacy of CPN as compared to CGN. There are few data to address this issue. While some have found CGN to be more effective in pain control, there are too few data to definitively reach this conclusion and other clinically important endpoints have not been addressed. Tip/Trick #5: Timing of CPN. At the current time, most endosonographers limit the use of CPN to patients with narcotic requiring pain and/or the presence of 3 of 10 or greater pain based on the visual analogue scale, since this is typically the treated population reported within the literature. In contrast, there is minimal experience that suggests improved outcomes when CPN is performed earlier in the disease course and in the presence of minimal pain, and some argue in the absence of pain. There are insufficient data to make a formal recommendation and some believe that the perceived improved outcomes may simply represent selection of a patient cohort that naturally possess a more benign disease course in terms of developing pain. Tip/Trick #6: Avoid CPN when tumor directly infiltrates the celiac artery. In our practice, we do avoid CPN whenever there is direct infiltration of the celiac artery or region of the celiac plexus. We use this restriction due to data indicating nominal or complete lack of response to therapy. While the lack of efficacy in this setting is not fully understood, it is believed to result from tumor overgrowth of the nerves and the lack of access of the neurolytic agents. The poor outcomes may also relate to the presence of more advanced disease that is often associated with more severe pain. Tip/Trick #7: Carefully consider the role of CPB for chronic pancreatitis. While meta-analyses and systemic reviews support the use and efficacy of CPN for pain associated with PDAC, the efficacy of CPB for chronic pancreatitis is less well established. It is unclear if the difference in efficacy reflects the difference in the chemical injectate employed and/or the underlying disease process. Therefore, we advocate careful patient consultation so that patients have an optimistic, yet realistic expectation of the outcomes. We occasionally perform CPB in patients with severe pain that markedly impairs their quality of life and only after failing other more traditional therapies. In addition, we may perform CPB for hospitalized patients with refractory pain, despite the absence of data indicating that such therapy abbreviates the hospital duration. Tip/Trick #8: Don’t forget about the risks. As for any procedure, patients should be properly informed and provide consent for the procedure. Procedural risks include diarrhoea, hypotension, constipation, nausea, vomiting and lethargy, which are each usually mild and transient. The presence and severity of hypotension may be alleviated by initial hydration with 500 to 1000 mL normal saline. The potential for increased bowel frequency may be regarded as a welcome consequence in patients with pancreatic cancer and heavy narcotic use, who often complain of constipation. Patients may also experience a transient exacerbation of pain that typically persists for several hours to no longer than two days. This is believed to be related to the acute neurolytic effects of alcohol injection. The injection of a local anaesthetic, with alcohol, helps ameliorate this risk. More concerning are the reports of neurologic complications (lower extremity weakness and/or paralysis) that in recent years been reported following EUS-guided therapy. While rare, the clinical impact is substantial and patients should be aware of this risk. An adverse event that is likely restricted to CPB, and not CPN, is abscess formation that presumably results from steroid administration potentially exacerbated by use of acid suppressive therapy that may alter the microbial environment. As a result, we administer intravenous antibiotics at the time of celiac block, but the bactericidal effect of alcohol obviates the need for antibiotics.